The definition of an ADS Historic Daffodil is any daffodil formally registered with the Royal Horticultural Society or known in gardens prior to 1940. This cutoff date marks the beginning of World War II, a time period during which fewer new daffodil cultivars were either created or made available, especially in Europe. The list below is of pre-1940 daffodils that have been grown by members of the America Daffodil Society Historic Daffodil Committee since 1989. Committee members have researched, collected and exchanged bulbs with the expressed purpose of correctly identifying and verifying cultivars. Side by side growing of exchanged cultivars allow studies showing the effects of growing conditions and verification of correct cultivars. 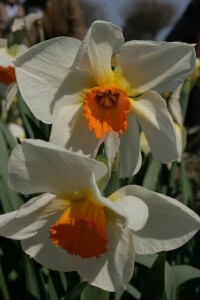 The Committee’s advocacy work resulted in the Historic Section found in ADS sanctioned daffodil shows. The Committee is dedicated to encouraging gardeners, public gardens, and ADS exhibitors to grow historic daffodils in order to assure their preservation for the pleasure and use of future generations. Non-members are welcome to expand this list, providing authenticity can be verified. The American Daffodil Society hosts an email discussion forum that is exclusively about Historic Daffodils. For more information, please use our “Contact Us” form. You can find a list of ADS Historic Daffodils on DaffSeek.org by clicking on “Special Classes” in the upper right box titled “Other Queries.” Check the Historics box under American Daffodil Society and click on “Submit Query.” Click on a specific Historic daffodil name and read detailed information and view one or more photographs.